Chlorthalidone is a phthalamide derivative of benzene sulphonamide and is designated as 2- chloro- 5- (1- hydroxy- 3- oxo- 1- isoindolinyl) benzene sulphanilamide. It is white to yellowish crystalline powder. It is practically insoluble in water, slightly soluble in alcohol. In the present study fast disintegrating tablets of chlorthalidone were prepared by adopting vacuum drying technique to study the effect of different subliming agents with various concentrations on disintegrating time. The powder blend was examined for the pre-compressional parameters. Formulations were evaluated for pre-compressional parameters such as angle of repose, % compressibility and Hausner’s ratio. Tablets were subjected to post-compressional analysis for the parameters such as hardness, friability, in-vitro disintegration time, wetting time and dissolution test. Drug compatibility with excipients was checked by FTIR and DSC studies. Stability studies were carried out as per ICH guidelines for three months. 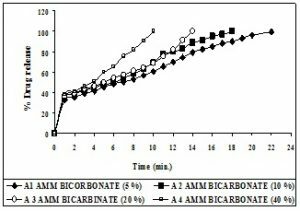 The results obtained showed that quantity of camphor, ammonium bicarbonate, menthol, and urea significantly affect the response variables (P> 0.05). 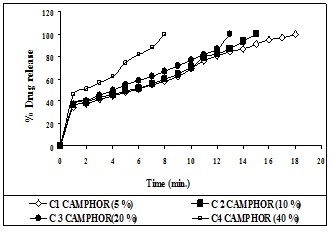 The results revealed that tablets prepared by the vacuum drying technique using 40% camphor (C4) significantly enhanced the dissolution rate of drug. Stability studies carried out as per ICH guidelines for three months and results revealed that upon storage disintegration time of tablets decreased significantly (P> 0.05). The results concluded that fast disintegrating tablets of chlorthalidone showing enhanced dissolution rate with increasing the concentrations of subliming agents. Among all the formulations C4, A4 and M4 shows the improved dissolution rate which lead to improved bioavailability and effective therapy by using vacuum drying technique. INTRODUCTION: Chlorthalidone is a phthalamide derivative of benzene sulphonamide and is designated as 2- chloro-5- (1- hydroxy- 3- oxo- 1- isoindolinyl) benzene sulphanilamide. It is white to yellowish crystalline powder. It is practically insoluble in water, slightly soluble in alcohol 1. For poorly soluble orally administered drugs the rate of absorption is often controlled by the rate of dissolution. The rate of dissolution can be increased by increasing the surface area of available drug by various methods (micronization, complexation, solid dispersion etc). Another prerequisite for the fast dissolution may be the disintegration time of tablets, because, faster disintegration of tablets delivers a fine suspension of drug particles and thus, greater dissolution of the drug 2. The rate of dissolution can be increased by increasing the surface area of available drug by various methods (micronization, complexation and solid dispersion) 3. The dissolution of a drug can also be influenced by disintegration time of the tablets. Faster disintegration of tablets delivers a fine suspension of drug particles resulting in a higher surface area and faster dissolution. Now a day fast dissolving tablets are gaining more importance in the market. Currently these tablets are available in the market for treating many disease conditions. More is concerned on hypertension 4, migraine 5, dysphasia 6, nausea and vomiting 7, Parkinson’s disease 8, schizophrenia 9, pediatric emergency 10. These conditions are those which require the drug to be formulated as fast dissolving tablets. Some patient prefers fast dissolving tablets to conventional tablets best of ease of administration, swallowing, pleasant taste and the availability in several flavors 11. The pediatric and geriatrics patients are of particular concern. To overcome this, dispersible tablets 12 and fast-disintegrating tablets 13 have been developed. Most commonly used methods to prepare these tablets are; freeze-drying/Lyophillization 14 tablet molding 15 and direct-compression methods 16. Lyophilized tablets show a very porous structure, which causes quick penetration of saliva into the pores when placed in oral cavity 14, 17. Molded tablets dissolve completely and rapidly. However, lack of strength and taste masking are of great concern 18. Main advantages of direct compression are low manufacturing cost and high mechanical integrity of the tablets 19. Therefore, direct- compression appears to be a better option for manufacturing of tablets. In the present work tablets are prepared by direct compression method involving incorporation of different subliming agents using vacuum drying technique. Crosspovidone (CP) was used as superdisintegrants. Effect of various concentrations different subliming agents on disintegration time, wetting time, and dissolution was studied. Different formulations were prepared by vacuum drying technique composition of which is given in (Table 1). MATERIAL AND METHODS: Chlorthalidone was procured as a gift sample from IPCA Laboratories, Mumbai. Crosspovidone was obtained as a gift sample from Maruthi Chemicals Ahmadabad. Menthol and ammonium bicarbonate were purchased from Laser chemicals Ahmedabad. Microcrystalline cellulose, mannitol, talc, magnesium stearate, camphor, and urea were purchased from SD Fine chemicals Pvt. Ltd. Mumbai. All other ingredients used were of pharmaceutical grade. Preparation of Tablets by Sublimation Technique: The tablets containing 25 mg of chlorthalidone were prepared by vacuum drying technique. The drug, diluents, super disintegrants, sweetener and subliming material were passed through sieve # 40. All the ingredients were properly mixed together in a poly bag. Talc, aerosil and magnesium stearate were passed through sieve # 80, mixed and blended with an initial mixer in a poly bag. The powder blend was compressed into tablets using 7 mm bi concave punches on a ‘Rimek mini press 1’ a 10 station rotary compression machine. After compression the tablets were collected and vacuum dried in a vacuum oven at 800 C until a constant weight was obtained to ensure the complete removal of sublimable component to make the tablet porous (Table 2). Evaluation of Chlorthalidone Tablets: The prepared tablets were evaluated for hardness, thickness and diameter, friability, disintegration time, wetting time, drug content, in-vitro dissolution studies, and stability studies. Pfizer hardness tester was used for the determination of the hardness of tablets. Where, W0 is the weight of the tablets before the test and W is the weight of the tablet after the test. Six tablets were tested from each formulation. In the Disintegration time 20 study tablets was put into 100 ml distilled water at 37±20. Time required for complete dispersion of a tablet was measured with the help of digital tablet disintegration test apparatus and in wetting time 21 study a piece of tissue paper folded twice was placed in a small Petri dish (internal diameter = 6.5cm) containing 5 ml of distilled water. A tablet was placed on the paper, and the time for complete wetting of the tablet was measured in seconds. For the determination of drug content tablets were weighed individually, pulverized, and diluted to 250ml with sufficient amount of distilled water. After that an aliquot of the filtrate was diluted and analyzed spectrophotometrically (UV-1700 Shimadzu Corporation, Japan) at 276 nm. The in-vitro dissolution study 22, 23 was carried out in the USP dissolution test apparatus (Electrolab TDT - 08 L Dissolution tester USP) type 2 (paddle). 900 ml of the dissolution medium (distilled water) was taken in vessel and the temperature was maintained at 37±0.50C. The speed of the paddle was set at 75 rpm. 5 ml of the dissolution medium was withdrawn and the same amount of fresh medium was replenished to the dissolution medium. The sample withdrawn was filtered and diluted with distilled water prior to analysis in the UV spectrophotometer (UV-1700 Shimadzu Corporation, Japan) at 276 nm. 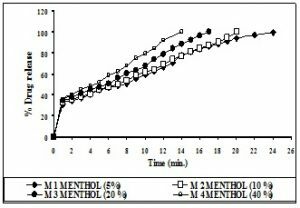 The stability study of the tablets was carried out according to ICH guidelines at 40±20C/75±5%RH for three months by storing the samples in stability chamber (Lab-Care, Mumbai). 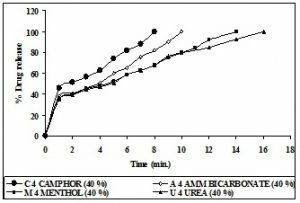 The stability study of the tablets was carried out according to ICH guidelines at 40±20C/75±5%RH for three months by storing the samples in stability chamber (Lab-Care, Mumbai). 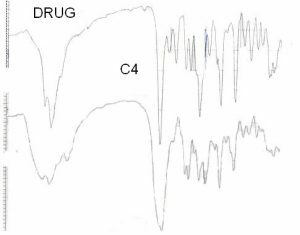 FTIR Studies: IR spectra for drug, tablets C4 were recorded in a Fourier transform infrared (FTIR) spectrophotometer (FTIR 1615, Perkin Elmer, USA) with KBr pellets. DSC Studies: DSC scan of about 5mg, accurately weighed chlorthalidone and tablet C4 were performed by using an automatic thermal analyzer system. (DSC60 Shimadzu Corporation, Japan) Sealed and perforated aluminum pans were used in the experiments for all the samples. Temperature calibrations were performed using Indium as standard. An empty pan sealed in the same way as for the sample was used as a reference. The entire samples were run at a scanning rate of 100C/min from 50-3000C. RESULTS AND DISCUSTION: Since, the flow properties of the powder mixture are important for the uniformity of mass of the tablets, the flow of the powder mixture was analyzed before compression to tablets. The values of pre-compression parameter evaluated were within prescribed limits as per USP XXVII and indicates a good free flowing property. The results are shown in Table 3. The data obtained from post-compression parameters such as hardness, friability, thickness, drug content, wetting time, and in- vitro disintegration time. In all the formulations the hardness values indicates good mechanical strength and the hardness of the tablets decrease with increase in the amount of volatile component 24. Friability of all formulations was less than 1%, which indicates that the tablets had a good mechanical resistance. Thickness of the tablets ranges from 3.28 to 3.95 mm. The weight variation results revealed that average percentage deviation of 20 tablets of each formula was less than ± 7.5%, which provides good uniformity. The disintegration time of tablets decreased significantly with increase in the concentration of volatile substances. Drug content of tablets ranged between 96.86 to 102.70%. The results are shown in Table 4. The formulations containing microcrystalline cellulose as filler (C1-C4, A1-A4, and M1-M4) showed minimum disintegration time this could be attributed towards disintegrating property of microcrystalline cellulose. 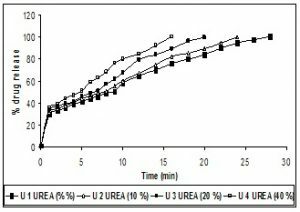 However, the formulations containing mannitol as filler (U1-U4) showed longer disintegration time, which could be attributed to slower dissolution characteristics of mannitol 25. Tablets prepared by vacuum drying technique rapidly exhibits high pores and disintegrates the tablets rapidly. It may be due to their lowest hardness and maximum porous structure was responsible for faster water uptake, hence it facilitates wicking action of crosspovidone in bringing about faster disintegration 26 the wetting time of tablets also decrease with increase in the concentration of volatile substances 26. Table 4 shows the disintegration time of the formulations were ranges between 6.00 - 49.24 Secs. By the addition of the superdisintegrants, the disintegration time decreased significantly (p<0.05). In sublimation method of preparation of tablets the disintegration time decreased regardless of the diluents used. It is because tablets prepared by sublimation method rapidly exhibits high pores and disintegrates rapidly. Tablets prepared with 4% superdisintegrants and 40% camphor showed least disintegration time as compared to all other formulations this is because of their porous structure responsible for faster uptake hence it facilitates wicking action of crosspovidone in bringing about faster disintegration 27. The dissolution of chlorthalidone from tablets is shown in Fig 1-4. The dissolution of the drug from the tablets prepared by vacuum drying technique using camphor had was quicker than those prepared by other subliming agents by vacuum drying technique. This may be due to their porous structure which is responsible for faster disintegration 27. Crosspovidone containing tablets rapidly exhibits high capillary activity and pronounced hydration with a little tendency to gel formation 28 and disintegrate the tablets rapidly. In-vitro dissolution studies on the promising formulations C4, A4, M4, U4 formulations were carried out in distilled water, and the various dissolution parameter values viz., percent drug dissolved in 4 min, 8 min, 12 min and 16 min (D4, D8, D12, and D16), t 50%, and t 90 % are shown in Table 5. This data reveals that overall, the formulation C4, A4, M4, and U4 shows nearly faster drug release. The formulations C4, A4, M4 and U4 50 % of drug released in 1.95 min, 3.92, 4.83 min, and 4.93 min respectively, and 90 % of drug released in 7.21 min, 8.96 min, 11.74 min, and 13.69 min respectively when compared to other tablet formulation. C4 promising fast dissolving tablet containing 40 % camphor as subliming agent, A4 promising fast dissolving tablet containing 40 % ammonium bicarbonate, M4 promising fast dissolving tablet containing 40 % menthol as subliming agent, U4 fast dissolving tablet containing 40 % urea as subliming agent. D4 is percent drug released in 4 min, D8 is percent drug release in 8 min, D12 is percent drug release in 12 min, D16 is percent drug release 16 min, t50% is time for 50 % drug dissolution, t 90% is time for 90% drug dissolution. Dissolution of drug from tablets containing highest volatile substance and MCC as filler (C4, A4 and M4) were quicker than other formulations. It may be due to highest porosity, lowest hardness and disintegrating property of MCC, which leads to faster water uptake hence it facilitates wicking action of crospovidone in bringing about faster disintegration and dissolution. Dissolution profiles of best formulations prepared by using different subliming agents were shown in Fig 5. The pure drug sample Chlorthalidone shown characteristic absorption bands (Fig 6) in the following IR region, IR (KBR) cm-1. The broad peak between 3280 - 3400 (OH-hydrogen bonded, NH2 and ring –NH), the peak around 3060 may be due to aromatic C-H stretching. The sharp peak at 1680 -C=0 of the ring 1620, 1560, 1480 C=C ring stretching peak at 730 substituted benzene. Tablet C4: The formulation C4 shows the characteristic absorption bands (Fig 6) in the following IR region. The broad peak in the range 3280-3400 shows the presence of –OH hydrogen bonded of both drug and Mannitol. -NH2 and NH of drug 2960. The peak at 3160 is an aromatic CH stretching of the drug however peaks at 2880, 2960 CH stretching. The sharp peak at 1680 may be ring C=O of the drug molecule. 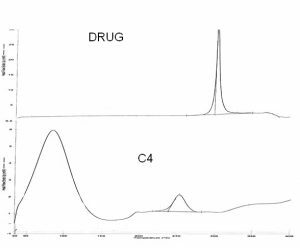 As there is no variation and shift in the position of characteristic absorption bands in the IR spectrum of the formulation C4 it can be justified that there is no interaction between pure drug and other excipients used for the formulation. Thermogram obtained by the thermal analysis of the pure drug has shown (Fig. 7) exothermic nature and the melting point of the compound appears to be around 225oC. The melting point of the compound from its thermogram is in agreement with the theoretical melting point of the drug. The sharp melting point justifies the purity of the compound. The DSC thermogram of the tablet C4 (Fig. 7) obtained from its thermal analysis reveals that there is no marked change in the melting point of the pure drug in its tablet C4 form. The melting point is in the range of 222oC which is in the permissible range. The thermal study of the thermograms reveals that the sharpness of the thermogram of the pure drug is reduced and appeared as a broad peak showing the melting point of the solid dispersion almost near to the melting point of the pure drug. As the peak height is reduced and has become more broad in nature indicates that there is a change in the physical state of the pure drug from its crystalline nature to amorphous, so the change from crystalline to amorphous nature is a characteristic property of the drug showing increase in the solubility of the drug. So therefore we can conclude that the solubility of the drug in the dosage form is much higher than the pure drug. Further as there is no change in the melting point of the drug in its pure form and in its dosage form clearly reveals that there is no interaction of the drug with the polymer. The stability study for all the formulations were carried according to ICH guidelines by storing the tablets in a stability chamber (Labcare, Mumbai) at 40o ± 20 C/ 75 ± 5% RH for three months. Decrease in the disintegration and the wetting time was observed in all the formulations, since during vacuum drying method tablets were exposed to only 6hrs at 800 C, where as 90 days and 450 C were used during stability studies. The long storage of 90 days at 450 C might have removed the trace amounts of volatile components; those were not removed during the short period bin vacuum drying method. There was no significant change in drug content of all the formulations (Table 6). CONCLUSION: The results of disintegration, time, wetting time and dissolution rate revealed that the amount of volatile component and type of filler significantly affect the dependent variables likes disintegration time, wetting time and dissolution rates. Thus it is concluded that fast disintegrating tablets can be prepared with a view of obtaining faster action of the drug and would be advantageous in compilations to the currently available conventional dosage forms. With the adopted vacuum drying technique an optimum point can be reached in the shortest time with minimum efforts and this technique would be an effective alternative approach compared with the use of more expensive adjuvant in the formulation of fast disintegrating tablets. Finally it can be concluded that the superdisintegrant and camphor had played an important role to decrease disintegration time and to enhance the dissolution rate in vacuum drying technique, hence could be used to prepare the Fast Dissolving Tablets. ACKNOWLEDGEMENTS: Authors thanks to IPCA Laboratories, Mumbai for providing a gift sample of Chlorthalidone and Maruti chemicals Ahmedabad for providing a gift sample of superdisintegrants. The authors are also thankful to Sri. S R Reddy, Chairman, Navodaya Education Trust, Raichur for his valuable support in carrying out this research work. The complete drug reference. 34th edn. London: Pharmaceutical Press; 2005. Alfred Martin. Physical Pharmacy. 4th Philadelphia: Lippincott Williams and Wilkins; 1993. Martin A, editor. Physical Pharmacy. 4th Philadelphia: Lippincott Williams and Wilkins; 1993. 324-62. Shirwaikar AA, Ramesh A. Fast disintegrating tablets of atenolol by dry granulation method. Ind J Pharm Sci 2004: 66(4): 422-6. Diener HC, Gendolla A. Part IV: effects of zolmitriptan orally disintegrating tablet on migraine symptoms and ability to perform normal activities: a post-marketing surveillance study in Germany. Curr Med Res Opin 2005: 21 Suppl3: 18-24. Carnaby Mann G, Crary M. Pill swallowing by adults with dysphagia. Arch Otolaryngol Head Neck Surg 2005 Nov: 131(11): 970-975. Hartsell T, Long D, Kirsch JR. The efficacy of postoperative Ondansetron (Zofran) orally disintegrating tablets for preventing nausea and vomiting after acoustic neuroma surgery. Anesth. Analog 2005 Nov: 101(5): 1492-1496. Lew MF. Selegiline orally disintegrating tablets for the treatment of Parkinson's disease. Expert Rev Neurother 2005 Nov: 5(6): 705-712. Chue P, Welch R, Binder C. Acceptability and disintegration rates of orally disintegrating Risperidone tablets in patients with schizophrenia or schizoaffective disorder. Can J Psychiatry 2004 Oct: 49(10): 701-703. 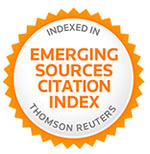 Freedman SB, Adler M, Seshadri R, Powell EC. Oral Ondansetron for gastroenteritis in a pediatric emergency department. N Engl J Med 2006 Apr 20: 354 (16): 1698-1705. Popa G, Gafitanu E. Oral disintegrating tablets. A new, modern, solid dosage form. Rev Med Chir Soc Med Nat Iasi 2003 Apr: 107(2): 337-342. Schiermeier S, Schmidt PC. Fast dispersible ibuprofen tablets. Eur J Pharm Sci 2002: 15:295-305. Mizumoto T, Masuda Y, Yamamoto T, Yonemochi E, Tarada K. Formulation design of a novel fast-disintegrating tablet. Int. J. Pharm. 2005: 306:83-90. Virley P, Yarwood R. Zydis. A novel fast dissolving dosage form. Manu Chem 1990; 61:22-9. Dobetti L. Fast-melting tablets: Developments and technologies. Pharm Technol Eur 2000: 12:32-42. Bi Y, Sunada H, Yonezawa Y, Danjo K, Otsuka A, Iida K. Preparation and evaluation of a compressed tablet rapidly disintegrating in the oral cavity. Chem Pharm Bull 1996: 44: 2121-7. Patrick K, Sang KW. Method of making freeze-dried dosage form. US Patent 5 631 023: 1997. Chang RK, Guo X, Burnside B, Couch R. Fast dissolving tablets. Pharm Technol 2000: 24:52-58. Takao M, Yoshinori M, Muneo F. Intra-buccally dissolving compressed mouldings and production process thereof. US patent 5 576 014: 1996. United States Pharmacopoeia. Rockville. MD: 27 th USP Convention, Inc: 2004. 2302. Sunada H, Bi YX, Yonezawa Y, Danjo K. Preparation, evaluation and optimization of rapidly disintegrating tablets. Powder Technol 2002: 122:188-198. Indian Pharmacopoeia, 4th Edn, Controller of publications, India, New Delhi, 1996: A-80. Indian Pharmacopoeia, 4th Controller of publications, India, New Delhi, 1996: A-82. Avinash MR, Devi KV, Asha AN, A novel technique for the preparation of mouth dissolving tablets of Domperidone. Indian Drugs 2003 Sep: 40(9): 544-546. Sarasija Suresh, V. Pandit and P. Joshi. Preparation and evaluation of mouth dissolving tablets of salbutamol sulphate. Ind J Pharma Sci 2007: 69(3): 467-469. Gohel MC, Patel MM, Amin AF, Agarwal R, Dave R, Baiya N. Formulation design and optimization of mouth dissolving tablets of nimesulide using vacuum drug technique. AAPS Pharm Sci Tech 2004: 5(3): article 36. Wikberg M, Aiderborn G. Compression characteristics of granulated materials. IV. The effect of granule porosity on the fragmentation propensity and the compatibility of some granulations. 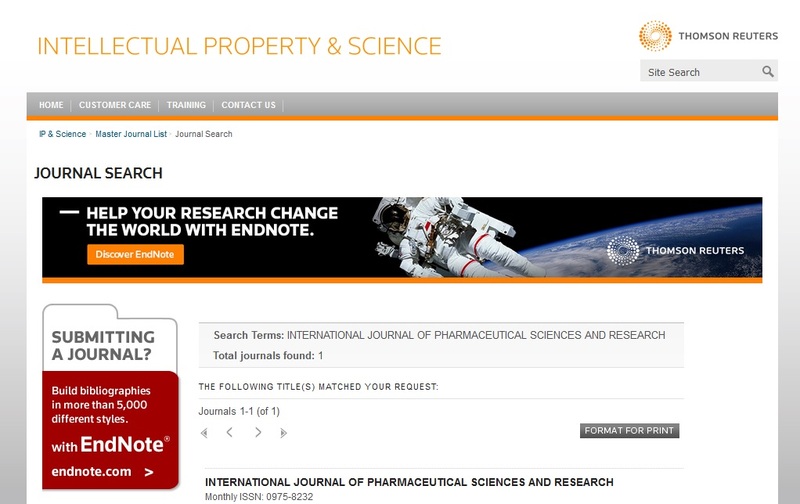 Int J Pharm 1991: 69: 239-253.